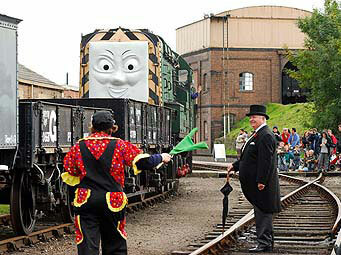 Thomas is a regular visitor to Didcot Railway Centre where he is welcomed by his friends the Great Western engines. Why not book in advance online? (Booking Fees apply). Bookings now open for October 2019. Meet Thomas and his friends and The Fat Controller, who will be keeping an eye on everything today. Enjoy rides all day and as often as you wish. Thomas the Tank Engine is running on his Branch Line and his friends are running on the Main Line. 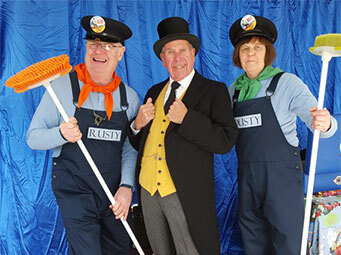 During the day, colourful ‘Professor Crump’ will be clowning around the Centre and ‘Twistina and Twistopher’ will be balloon modelling. Thomas story readings will be held hourly from 11am in the Imagination Station. Don't forget to collect your souvenir ‘Day Out With Thomas’ Certificate signed by The Fat Controller. A wide range of souvenirs is available in the ‘Thomas’ shop. There is a Refreshment Room serving lunches, snacks and drinks and also a picnic area where you can sit and watch the trains go by. Whilst at Didcot, remember to take a walk round the Engine Shed to see more of Thomas’ friends. The event operates continuously from 10am to 5pm. Don't forget, we also run Day Out With Thomas and meet Father Christmas events. Family (Two adults and up to two children) - £44.00. 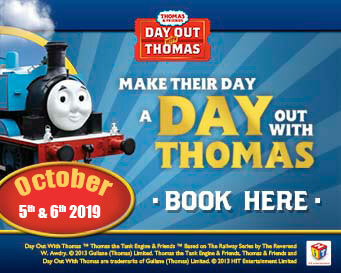 Special admission offers including child free, money off, 2 for 1 and Tesco Clubcard vouchers may not be used for 'Day Out With Thomas' events. for entry to Day Out With Thomas events. Family membership cannot be purchased in lieu of admission fee on Day Out With Thomas days. Sorry, but we do not have space to accommodate prams or buggies on our trains, or in our restaurant. Buggy Parks are provided by the entrance to the both train rides and outside the restaurant. You should also be aware that there is an unavoidable flight of 18 steps at the entrance to the Railway Centre. Admission tickets are on sale on the day but you can book in advance online (Booking Fees apply). Bookings now open for October 2019. Based on The Railway Series by The Reverend W.Awdry. Thomas the Tank Engine & Friends, Thomas & Friends and Day Out With Thomas are trademarks of Gullane (Thomas) Limited. Thomas the Tank Engine & Friends and Design is Reg. U.S. Pat. & Tm. Off. © 2019 HIT Entertainment Limited. HIT and the HIT Logo are trade marks of HIT Entertainment Limited. Find out more about Thomas and his friends on his official website.